I started running the same as the rest of us, at school and whilst at Landseer middle school. I was in the cross-country club where we went out for a XC run over the Lairs during school lunch breaks, this was before the Orwell Bridge was built so that ages me more than I care to admit. After leaving school there was a lean patch where apart from some badminton, sport was very limited but in 1990 I started doing some martial arts. After training in several styles, I settled on EKKA Tae Kwon Do which I did for 4 years and managed to get to 1st Brown before disaster struck. Whilst playing badminton one Saturday I ruptured my right Achilles tendon which resulted in eight weeks in plaster followed by 10 weeks of physio (at the Bartlett in Felixstowe). Rehab took a while but after a few months I started horse riding doing as many aspects of it as I could show jumping, dressage, cross country, team chase, side saddle, western, you name it and I tried it. Did quite well with many placings and a board full of rosettes, many of them 1st I might add. I used to work for a Dutch company in Felixstowe called Verbrugge and worked opposite a lady called Elaine Brinkley who used to run for Felixstowe with her husband Steve. I attended my first session in Sept 97 which was an interval session using a football pitch on the grass up at the grove, I loved it! We used to meet up at the bottom of Bent Hill and be given a session plan/idea by George Buxton and disappear off and do it, no questions asked, apart from our sanity and gullibility to say yes. After a couple of AGM’s, I put my hand up to volunteer to be Vice Captain but due to ill health (of the then Captain) that year I was taking on the role of Captain to support (back then we had a men’s and women’s Captain). The following year I was promoted to full Captain and remained there for a couple of years before I stood as Chairman for four years. During this time the club grew in numbers and with additional UKA rules enforced, in June 2006 Tim, Sally and myself did the first ever Run Leaders course in Copleston in Ipswich. This was because instead of just turning up and enjoying ourselves on a Tuesday, UKA said that there had to be somebody in charge for insurance purposes and to structure the sessions. Just the three of us used to plan and run all the Tuesday sessions between us so we were much relieved when others started to join us – and the rest is what you suffer each Tuesday now. Running wise, I did my first race in red during December 1997 at the Bury cross country, followed by Brandon cross country in Jan 98 and my first road race at Jaffa Friday 5 in May 98, although this was the old course which started at Claydon school then roads to Barham fields, over to Sandy Lane, back along Norwich Road to Claydon. No traffic management back then just a few marshal’s telling us to cross a main road and be careful, never any incidents either! I did a few more races in 98 but in 99 my race turnover was 1 every 2 weeks with 26 races being completed at various distance, including many that don’t even exist anymore like Turkey Trott (Lowestoft), Bildeston 10K and Half Marathon and Mutford 5K relays. 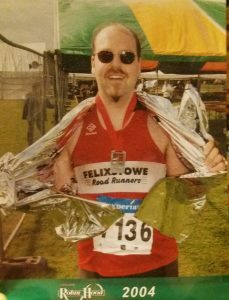 In 2000 I kept the output up and completed my first big race doing the millennium Great North run in 1:42 and the Felixstowe Half in 1:41. By 2001 I had started to train harder and chose races rather than just race every couple of weeks and with the results still being most of my PB’s with a 10 mile of 1:12, Half of 1:39, 10K of 44:23 and 5 mile of 35:11 – times I would love to get near 16 years later. After this I still ran but had a re-occurring Achilles tendon problem that would stop me getting decent training in when it would flare up every few months. In 2003 I decided to try a marathon. I entered London and decided that if that failed I would go for a late summer one instead, I of course failed to get into London (think it might have been Mars back then) so aimed at Nottingham in Sept 2004. Training went well over the summer but my legs were uncomfortable so I decided to have a sports massage to try and free them up a bit, worst thing ever in hindsight. The massage determined that my IT bands were tight and needed releasing amongst other deep tissue work but this release caused me to suffer dead calves and shin splints in both legs, not the result I was hoping for. After another session to try to help these new problems I had to go to the doctors for a course of antibiotics because all the deep tissue work on my calves had caused toxins to come to the surface and I had loads of boils and pustules appear (it was as gross as it sounds). This was four weeks before the marathon and I was having trouble running now because of it, a week before the event I went for on my normal 8-mile route around the Orwell river path and had to walk because I couldn’t keep going, things were looking bleak. We went up to Nottingham on the Saturday and stayed over and I was having to hold onto the stair rail to go down to breakfast on the morning of the race so didn’t have much hope. I joined the thousands doing the half and full that morning having kissed Rachel and told her that depending on how I felt I might only do the half instead and pull out of the full. I started off and it was a very hot day in September and amongst fifteen thousand runners there was a bit of elbow action going on. For those who haven’t done this race I can recommend it because they have all the full and half marathon people go off together along with the relays teams doing 21k in 5k legs and the atmosphere is amazing. I was going well and the legs had started to ease off and after 10 miles was in a nice steady rhythm so thought I might be OK, at 12 miles the marathon people head off over a bridge and under the edge of the Nottingham Forest Football ground along the river whilst the half marathoner’s all head straight for the finish, I decided to head over the bridge and keep going. At about 14 miles I hit the wall and remember not being able to walk straight let alone run, after another half mile I managed to keep a jog/walk routine up and decided to jog to the water tables (approx. every 2 miles) and then walk to get a drink and not start again until I had finished the drink. I managed to finish in a time of 4hrs 33mins but it was the worst experience of my life. In 2013 I helped a work friend Sam train for the London marathon, which gave me a thought of doing it again 10 years on so in 2014 I stood on the line of the Bungay marathon and managed to finish in 4:28, not happy with this because I wanted a 10 min/mile pace I did it again in 2015 and managed a time of 4:13 so that was that demon put to bed. I hated all three of them so have no plans to repeat the 26.2 distance ever again! Not sure if we have ‘favourite races’ or maybe that’s how it feels looking back, certainly not during the dam things. I have always enjoyed the Heritage races; I did the 6 miler a couple of times and then stepped up to the Half which I have finished three times now. This is a lovely scenic half that lets you enjoy the local countryside and the Rotary Club do a great job organising it every year. I have also enjoyed taking part in the Round Norfolk Relay on four occasions, although this usually falls the weekend of my wife (and mothers) birthday on 16th Sept so is usually difficult to disappear for. I have enjoyed racing this year and have been surprised with how many people I have passed that are better than me, a lot of people have been struggling with form and injury to have me go past them, that’s for sure. I don’t have any great stories to relate like some of my predecessors, I’ve never done an ultra-race or taken part in something as massive as SVP or a big group run chasing the sun or a wall and probably will never be able to either. Hopefully one day I will manage to do something massive like these but at the moment I’m happy to keep going and staying healthy/fit, but who knows, maybe one day I will have a real story to tell. Some of my favourite moments may seem a little strange to some as they are defeats rather than victories but I’m afraid the glass is half empty. I remember doing the Equinox Lowestoft 5 miler in Sept 2001 and my form was good and the course was flat so it was PB time. I started off well and was clocking sub 7 min pace for the first 4 miles and was finally on for a sub 35 min time when I turned a corner and hit a killer headwind. I pushed as hard as I could but the seconds I had gained were all slipping by and I came over the line in 35:11 – gutted but I look back now at what I was capable of. As I have mentioned, I like doing new races and saw last year of the first running of the Thetford Half and Full marathon in 2015 with only a handful of entries, about 20 people over both races I think. I entered and then tried to find out more information on the route but it was a trail race where you get instructions that you have to carry with you, so I did what I always do and studied the details given and worked out where we would go. It was a haphazard event where all the people who had ‘pre-entered’ were left off the sheet and had to wait for somebody to find the missing sheet to give us our numbers, good start eh! It was a lovely day and perfect for running so I went off about 8:30 pace and soon only three people were ahead of me, what the hell is going on here I thought. All the way to the half way turn around point nobody was on my heels and only two people had started back heading for home so I was in third! After a small route error (missed a turning so did an extra half a mile) I got back on track and headed back into Thetford for the finish only to find a chap had gone the right route and over taken me so I was downgraded to fourth overall and third male. My best result and a tin pot classic if I ever saw one, I want to do this one again and, although the organising isn’t great, the race and trails were. This year I was on the start line for my first ever Gt Bentley Half and was not sure now it would go as I had only raced cross countries for the last few races so road pace was unknown. Started off OK and the first few miles rolled by at 8:15 pace so I decided to go with it and see how long it lasted, at 6 miles the imposing figure of Shabba came into view and I was catching him. After a few pleasantries, I pushed on and left him, fully expecting him to pull level and disappear past me any moment but he didn’t appear, then as I turned the last corner and see the stretch of grass with the finish straight, Shabba bombs past me at sub 6 min pace and takes the line and the win. He said I was his carrot and he was trying to chase me down but he did me good and proper, kudos mate. I have been interested in the official’s side of running and have been a member of the SCAA committee for several years and was elected Vice President three years ago after serving for ten years straight. I have also completed some of the official’s courses and qualified as a referee but at the bottom rung you are only able to referee races of 300 runners or less, which does limit the ones to choose from to be honest. I was honoured to be asked to referee the Brantham 5 miler in 2016, with a field of 200-250 it was one of the few I was qualified to do. I was a great experience and I hope to be able to build on this so that I can increase my grading to allow me to cover more and bigger races in the future. Fantastic story of a true club legend. I would forward your favourable comments onto my friend who is the mainstay at Heritage but dare not, given your mixing of Lions for Rotarians! Great read though Wildcat, well done in pulling it together. Great read Jon. Thanks for the mention. You’d got me good and proper at Bentley. I’d chased you since you passed, but you only faded in the last 1/2 mile. I look forward to more battles soon.